This is a great oven-baked blend of cooked chicken, soups, celery, onion, water chestnuts, mayonnaise, with a crumb topping. Saute 1 cup of finely-chopped celery and 2 tablespoons finely-chopped onion in 1 tablespoon melted butter over low heat, stirring occasionally. Set aside. In a large bowl, combine 2 cups cooked, chunked chicken, 1 cup cooked white rice, 1 can cream of chicken soup, 1 can Cheddar cheese soup, 2/3 cup mayonnaise, 1 can drained water chestnuts, and the previously sauteed celery and onion. Mix well and pour into a 13-inch by 9-inch by 2-inch baking dish, which has been sprayed with cooking oil spray. Use the back of a spoon to smooth out mixture until it is even. Bake at 350 degrees (F) for 20 minutes, until bubbly. Mix 1 cup cornflake crumbs with 2 tablespoons melted butter. Sprinkle evenly over partially baked casserole. 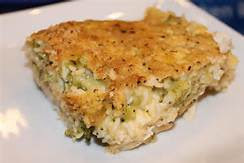 Return casserole to 350-degree (F) oven and continue to bake 10 minutes longer, until the topping is browned and the whole casserole is bubbly. Remove from oven and serve immediately! MMM. This looks delish. Thanks for sharing!